This graceful memoir brought me almost more nostalgia than an aging environmentalist can deal with. The biggest event in my life, even though I was thirteen years old when it ended, was the Second World War. I wanted badly to serve--the foolishness of a young boy. Subsequently, I often wondered what it would be like to have actually seen combat and have read many wartime accounts. But none of them have impressed me as much as Ray Dasmann's story, perhaps because he's always been one of my heroes and shaped many of my attitudes. He was under fire in New Guinea. I never got there until 1965, when I was in the South Pacific, doing research on butterflies and visiting famous battlefields. I can remember chasing a specimen into the bush near Lae and finding a corroded tray of Nambu machine-gun ammunition. I couldn't help wondering what it would have been like to share the dense rainforest with people determined to kill me. Ray's story of cowering terrified in a foxhole while there was a "constant whine and snap of rifle or machine-gun bullets passing nearby" gave me one perspective on that. He could not see his enemies because they were hidden in the jungle--which, remembering my own experience in New Guinea jungles, I found all too understandable. And, of course, Ray's childhood, and much of his life, was spent in central California--the land of milk and honey that is my adopted home. But Ray's stories of the San Francisco Bay area before I arrived (and of his early days in the forest service) made me wish I'd been able to flee the awful East even earlier. Ray came into the environmental movement from game management--in some ways the same route used by Aldo Leopold. He got his feet wet in the politics of deer; there were too many for the tastes of farmers who didn't like them eating their crops, too few for hunters who wanted a big supply to blow away and eat. The deer he studied had populations much larger than their range could support, but trying to introduce a doe hunt to restore some balance was anathema to the hunting community. Today the hunters would be joined by the "animal rights" movement. They would rather have natural ecosystems ruined and many populations of their non-human inhabitants driven to extinction than allow a hunter to kill and animal whose public image was created by the cartoon movie Bambi. Of course, I'm sympathetic with some of the goals of the animal rights movement--protecting animals from the "fur trade," ending some obnoxious practices in animal agriculture, and guarding against superfluous use of living animals in research (some of it is not essential). But, for example, when the movement favors extermination of elephants over sustainable harvesting by rich but not-too-bright hunters (with great benefits to local villagers), as it has in trying to sabotage the "Campfire" program in Zimbabwe, I'm on the other side. So, I'm sure would be Ray, who had extensive experience on the magic continent of Africa. Other places where we have both learned to appreciate foreign peoples, faunas, floras, and conservation situations include Australia, Costa Rica, the Leeward Islands, and Malaysia for oil palm agriculture. That really struck a note for me, because Anne and I did research on butterflies in those magnificent forests, aided by aboriginal people, in 1966. In 1997 we visited the area again and were appalled at the extent to which Southeast Asia had been converted into oil palm biological deserts. Ray is just enough older than I to have had the privilege of meeting some of the conservationists that influenced my thinking when I was an undergraduate at the University of Pennsylvania. He actually knew Bill Vogt, whose ideas (along with those of Fairfield Osborne), Ray correctly implies, formed part of the basis of my Population Bomb. He was in on the very start of the modern environmental movement, working with the legendary Frank Fraser Darling at the Conservation Foundation in Washington. His own 1965 book, The Destruction of California, published just three years after Rachel Carson's Silent Spring, was a pioneering monument in what was soon to be an explosion of books on the environment. Later, as he recounts, he became familiar with the ups and downs of international environmental politics. Things haven't changed much. Today advances like the Montreal Ozone Protocol contrast with foot-dragging on greenhouse agreements and the stupidity of George W. Bush's assault on U.S. aid to women in poor countries needing access to family planning. There are many treasures in this wonderful book, and some tragedy too, but I'll leave you to discover that for yourself. Like most naturalist/environmentalists, Ray early recognized the major role played by the human population explosion in the deterioration of Earth's environment. He was there way ahead of Population Bomb. And by 1971 he had coined what he called the first law of the environment, "no matter how bad you think things are--the total reality is much worse." It's sadly even more true today than when it was then. A pioneer in international conservation and wildlife ecology, Raymond Dasmann published his first book, the influential text Environmental Conservation, when the term "environment" was little known and "conservation" to most people simply meant keeping or storing. This delightful memoir tells the story of an unpretentious man who helped create and shape today's environmental movement. 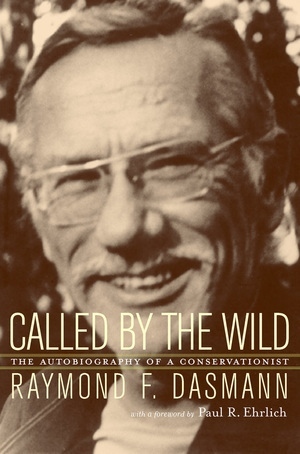 Ranging from Dasmann's travels to ecological hotspots around the world to his development of concepts such as bioregionalism and ecotourism, this autobiography is a story of international conservation action and intrigue, a moving love story, and a gripping chronicle of an exceptional life. Dasmann takes us from his boyhood days in San Francisco in the early 1920s to his action-packed military service in Australia during World War II, where he met his future wife, Elizabeth. After returning to the United States, Dasmann received his doctorate as a conservation biologist when the field was just being developed. Dasmann left the safety of academia to work with conservation organizations around the world, including the United Nations, and has done fieldwork in Africa, Sri Lanka, the Caribbean, and California. This book is both a memoir and an account of how Dasmann's thinking developed around issues that are vitally important today. In engaging conversational language, he shares his thoughts on issues he has grappled with throughout his life, such as population growth and the question of how sustainability can be measured, understood, and regained. Called by the Wild tells the story of an inspirational risk taker who reminds us that "the earth is the only known nature reserve in the entire universe" and that we must learn to treat it as such. Raymond F. Dasmann is Professor Emeritus at the University of California, Santa Cruz. Among his many books and publications are Environmental Conservation (fifth edition 1984), Wildlife Biology (second edition 1981), California's Changing Environment (1981), and The Destruction of California (1965). 4. Live Coward or Dead Hero?